BJP has sealed its state-wise alliances well in time, but Congress seems to be struggling, with regional parties reluctant to cede space to it. 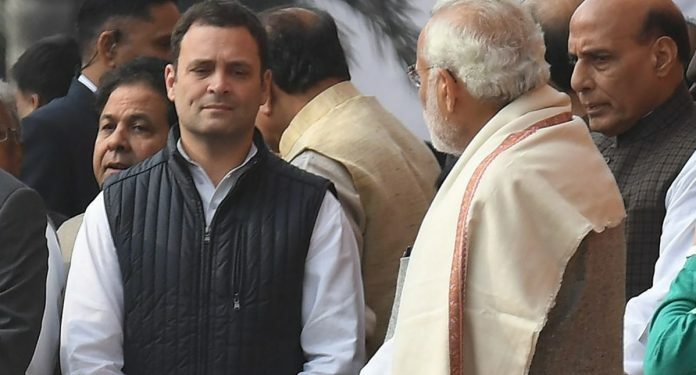 New Delhi: The opposition parties, led by the Congress, had set out to make an ‘anti-Modi’ argument the main theme of the 2019 Lok Sabha elections, but the push back that Rahul Gandhi’s party is receiving across states from potential allies reluctant to cede space to it has brought the ‘anti-Congress’ agenda to the fore. The Bharatiya Janata Party (BJP) has sealed its state-wise alliances well in time for the elections due to begin on 11 April, but the Congress seems to be struggling. The alliance in Bihar remains stuck, the possible arrangement with the Left in West Bengal has collapsed while the party has been left out of the grand coalition in Uttar Pradesh. The underlying reason for the grand old party’s precarious situation is the desire of all parties to not give Congress, once a dominant force in all these states and so a rival, much space. In Delhi, however, the Aam Aadmi Party (AAP) has been consistently expressing its interest to ally with the Congress. In Bihar, the opposition alliance’s plan to announce its seat-sharing arrangement Sunday did not materialise with the Rashtriya Janata Dal (RJD) demanding the Congress sacrifice seats to accommodate allies. Of the state’s 40 Lok Sabha seats, the Congress wants to contest 11 while the RJD is willing to give it just 8 and contest 20 itself. The remaining seats are to be distributed among Rashtriya Lok Samata Party, Vikasheel Insaan Party, Hindustani Awam Party, Jan Loktantrik Party and the Communist Party of India (CPI), all of whom want a larger share of the pie. According to an RJD leader, who did not wish to be identified, the party leadership has told the Congress to “go it alone if it wants more seats than the alliance is willing to offer”. The RJD, particularly its leader Tejashwi Yadav, is reluctant to allow the Congress to grow in the state and pose a challenge to it. While defeating the BJP is a common aim, the RJD source said opposition parties also consider the Congress to be a key rival, and so would not want to allow it to expand its presence in the state. RJD chief Lalu Prasad, much like Uttar Pradesh’s Mulayam Singh Yadav, is a socialist leader who has his political roots in an ‘anti-Congress’ ideology. The Congress and the Left had been in prolonged negotiations to arrive at a seat-sharing arrangement in the state but failed to come to an understanding. The bone of contention were two seats — Raiganj and Murshidabad — which both the Communist Party of India (Marxist) and Congress wanted to contest. With the CPI(M) unwilling to give way to the Congress and its demands, talks were called off Sunday evening with both sides claiming they would fight alone. All three important stakeholders in the state — the Congress, the Trinamool Congress and the Left — have been together at the forefront of forging a grand national coalition to defeat Modi-led BJP. However, in the only state where all three have a presence, no alliance has been stitched so far. The Left and the Congress are political rivals and have traditionally fought each other not just in West Bengal, but also in Kerala. The Left supported the United Progressive Alliance (UPA)-1 government but the equation ended badly when it withdrew support over the India-US nuclear deal. In the 2016 assembly elections in West Bengal, the CPI(M)-led Left front allied with the Congress, despite opposition from several quarters, and faced its worst defeat. Embarrassingly, the CPI(M) performed even worse than the Congress. The party is, thus, unwilling to concede space to the Congress in a way that would bring about a repeat of 2016 when it ended up undermining its own position. The Trinamool’s politics, meanwhile, has been built as much on ‘anti-Congress’ agenda as on an anti-Left plank and thus, it is reluctant to share ground with either. The Samajwadi Party (SP), the Bahujan Samaj Party (BSP) and the Rashtriya Lok Dal (RLD) cobbled together a thought-out alliance in Uttar Pradesh, but left the Congress out of their fold. The mismatch between the grand old party’s demand for seats and how much the others were willing to spare for it has led to much bitterness among them, despite all opposition parties originally having set out to defeat the BJP together. The Congress has been steadily losing ground in Uttar Pradesh — electorally the most crucial state — and Akhilesh Yadav’s SP and Mayawati’s BSP are disinclined to give it space that might allow it to grow and re-build its base. While Modi may have been proclaimed as a common enemy, in all these states, the opposition parties continue to view Congress with suspicion and seem disinterested in giving it any extra inch of space. The BJP, meanwhile, has succeeded in bringing difficult allies on board, although after much concessions on its part. After reading about the imminent downfall of NDA continually in the last two years, it is very interesting to find many self styled political commentators going the other way. Obviously they will not admit that they have got their assessment incorrect. Hence the rush to blame Congress and its entitled leadership. No wonder media, whether TV, digital or print, is quickly losing its credibility. Defies both logic and comprehension. A glum assessment of the Congress – NCP prospects in Maharashtra by Shri Nikhil Wagle. 2. Instead of haggling with allies for scraps in states where it is not relevant, the Congress should be focusing on where the juicy steaks are. There are potentially another 62 out of 65 seats in R / M / C. Gehlot and Nath should be left in no doubt they will be made to walk the plank if they fail to deliver.